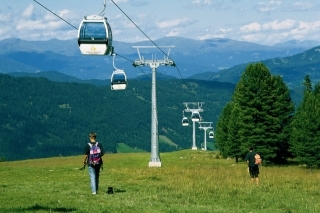 The lift of Kreischberg ski slope located 6 km from Murau also operates in the summer in July and August every Wednesday and Sunday. Trout fishing at Rieglerhütte: You can catch the trout from the nice mountain lake with the fishing rod of Heinz and it will be roasted by the pretty hostess of the hütte, while you can go on a pleasant excursion to Rosenkranz Summit. - The most beautiful mountain and lake combination of the neighborhood at 1600 m. You can start your excursion from 2000 m with the help of mountain lifts (Kornockbahn, Panoramabahn), from where there is a breathtaking view to the lakes of Turracher Höhe. - We recommend the 3 Lakes Tour to those preferring lighter hikes and Nordic Walking. The 1600-meter-long winter/summer bobsleigh slope is unique in Austria. 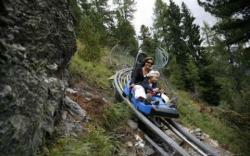 The jumps and paths of the bobsleigh slope that feels like a roller-coaster give an unforgettable experience to the young and old by guaranteeing the highest level of safety. When you look down in one of the slower corners, you can enjoy the fascinating sight of Nockbergen and Lake Turrach.